The Saisiyat received their name, because, according to their oral tradition, the name was sacred, chosen by the god Opoh Na Bolhon. Their tradition also states that Opoh Na Bolhon used his power and magic spells to create the ancestors of the Saisiyat. 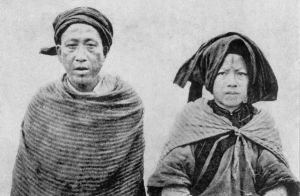 In 1919, under Japanese rule (1895-1945), the Saisiyat were officially recognized as an independent ethnic group. Currently they have 15-16 surnames, each corresponding to a special totem that is its characteristic symbol. 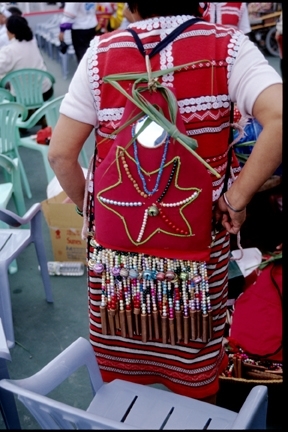 Throughout their history, the northern Saisiyat have encountered cultural and environmental influence on a large scale from the Atayal, as have the southern Saisiyat from the Han and Hakka Chinese; thus, the ethnic group has internalized the traits of moderation and patience as key components of their personality (Zheyi Tien, 2001). Saisiyat oral history states that the ancestors of the group migrated to avoid natural disasters, and that they once lived on the coastal plain area of the adjacent counties of Taoyuan, Hsinchu and Miaoli. Now, most of them live in the mountainous regions of Hsinchu and Miaoli County. 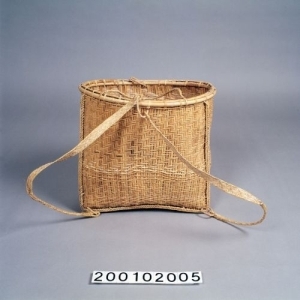 They previously lived around the western plain at Jhonggang Township in Miaoli County to the west, Dahhan River to the north, and at the Dahan River drainage area to the south. The Saisiyat, who lived along the mountainous border between the two counties of Hsinchu and Miaoli, were surrounded by the Atayal and the Pingpu (plain aborigines), and were thus forced into a narrow valley. They were also further divided by the mountain range between Egongji Mountain and Hengpingbei Mountain, forming a northern group and a southern group. 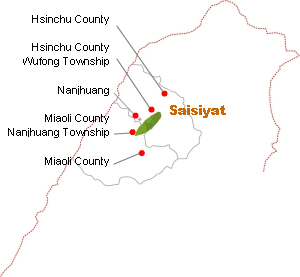 The Saisiyat who lived in Wufong Township are called the northern Saisiyat. They were surrounded by the Atayal and consequently referred to as “ShangFan” (not enculturated by Han Chinese). Those who lived between the neighboring mountain areas of Nanchuan and Shihtan Townships of Miaoli County are called the southern Saisiyat. They lived near the Hakka people, so they earned the name of “Nan-Chuan Hua-Fan” (The barbarians of Nan-Chuan who submit their authority to the Emperor). 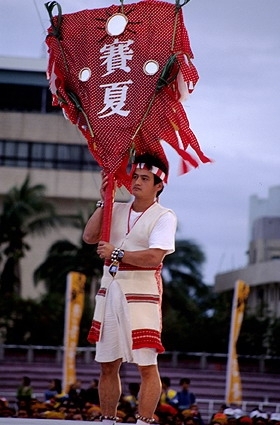 he Saisiyat, with a population of around 7,000, make up 7.32% of the total indigenous population of Taiwan. They live in Wufong Township in Hsinchu County, and Nanchuon and Shihtan Townships in Miaoli County, which are within the hilly, low elevation region between Hsinchu and Miaoli Counties. Hence, they are divided by the mountain range between Egongji Mountain (hororok) and Hengpingbei Mountain (amish), forming a northern group and a southern group. 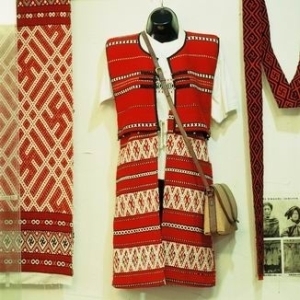 The northern group (sai-kirapa) spread throughout the upstream region of Touciian River (Shangping River), which includes the Wufong, Shandaai, Kaoufong and Moupu tribes in Daai Village and Bilai tribe in Huayuan Village, Wufong Township, Hsinchu County. Due to the dominance of the Atayal population in Wufong Township, the Saisiyat there have long had contact with them, and have now become enculturated to a great extent by the Atayal. The southern group (sai-maghahyobun) lives within Miaoli County; its population is distributed throughout the valley of the Duon River and the Nan River (the upstream region of Chuonkang River) and the upstream regions of the Houlong River (Zihu Stream, also known as the Shihtan River). The basic component of the Saisiyat social structure is the house (tau’an), which is formed through the concept of a common kitchen. Consequently, the Saisiyat’s way of forming a new family is to begin eating and living separately, but to continue to share property with the original family. Their households are spread around the river banks of the continuous mountain areas, forming settlements called Aha rito, and the number of houses in these settlements ranges from 3 to several dozen. Larger villages are called Kinatsangan. They are composed of settlements and correspond to the area where a particular regional surname ritual group is located, known as aha Pas-Bakean. In a given area, there are usually more than two surname ritual groups. Some scattered villages combine into smaller tribes (asang), which contain several surname groups. 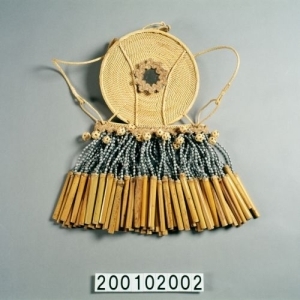 Some tribes used to cooperate to form alliances in a particular river drainage area (these alliances were also known as aha ware, meaning “one river,” or aha buyuhyo, meaning “one bow”) in order to fight against intruders and resolve disputes related to hunting grounds and river related resources. Many alliances would cooperate out of strategic military considerations, forming two groups: the Northern Group and the Southern Group. These two groups were “offensive and defensive alliances,” or “fighting alliances” (aha kapupapanaan). The two groups together made up the entire Saisiyat ethnic group. For daily life and religious needs, Saisiyat society is composed of households (dau-an), families (aha vake), ancestral spirit ritual groups and surname ritual groups. Seeding rituals are held at the household level, and tomb visits and ancestor worship are conducted on the family level. Ancestral spirit ritual groups function as a unit for tribal ancestral spirit worship. Only few surname ritual groups have the power to be priests and to dominate the inter-tribal ritual activities that the entire ethnic group carries out together. Their social structure is that of a typical patriarchal clan society. The surname system is the core principle for distinguishing among members of Saisiyat groups. Surname clans can be seen as symbols categorizing Saisiyat people into various groups. Therefore, surnames are a concept used as a classification system, and they also fulfill practical functions in society. The Saisiyat have many surname groups. They use Chinese characters to translate their surnames into Mandarin, including Dou (Tsaou), Si, Shi, Fong (Fong, Fong, Dong), Pan, Keng, Chein, Sha, Shie (Shie), Kao, Chuang (Chuang), Chuong, Zi, Chu, Hu (Hu), Chan (Chang), Shue, Mo. Among these, the Shi, Shue and Mo have no more descendents, so the number of surname groups currently totals fifteen. People with the surnames of Dou, Fong, Shie, Chuang, Hu and Chan live in various different areas, and tend to have Chinese surnames that differ from one another, though they all actually belong to the same Saisiyat surname groups. The names were translated into Chinese either according to considerations of phonetic similarity, or according to their meaning. Saisiyat surnames represent patriarchal consanguine groups, and they are used by one specific group only. Each clan is equal when participating in tribal political affairs. According to anthropologist Hueling Wei, the clans in Saisiyat function as exogamy units. Marriage within clans or phratries is prohibited. Some clans have the privilege of becoming priests in specific rituals: the Chu, for example, are in charge of the “Dwarf Spirit Ceremony;” the Pan are in charge of the “Sky Worship Ritual;” the Dou are in charge of the “Enemy Head Ritual,” and the Sha are in charge of the “Worship of Solo (Holy animal),” and so on. Aside from this, each clan functions as an owner and appropriator of land, and clans work together to obtain revenge during feuds. Each clan has some common ancestors shared by all of its surname groups, but different surnames also have their own ancestors, and members of a surname group call one another auma in order to distinguish members from the same surname group from members of others. Therefore, Saisiyat clans are symbols to differentiate human groups, and people with different surnames become, in turn, members of smaller groups. Depending on the occasion, the group of people that the Saisiyat consider to be members of their own group can change to include a larger or smaller range of individuals, providing the group with more or less cohesive force. The Saisiyat rituals such as the Ancestral Spirit Ritual, the Seeding Ritual, the Sky Worship Ritual and the Dwarf Spirit Ceremony are carried out by all clans, and some other rituals fall within the exclusive purview of specific surname groups. The Ancestral Spirit Ritual (Pas-vake) is also one type of agricultural ritual, and is held from one to three times per year, depending on the surname ritual group. These surname groups are composed of members with the same surname, and adopted sons and daughters also belong to the groups, since they are also protected by the group’s ancestral spirits. The seeding ritual is held around April, corresponding to the sowing season for paddy rice. 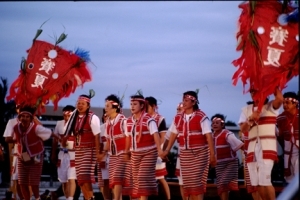 Among the southern group, only the Siiangtianhu tribe still practices this ritual. In this tribe, the priest is not always the same man; rather, the position rotates among different clans now living there. The Sky Worship Ritual is held around the 15th day of the 3rd lunar month and it is directed by the Pan family. There is a “big” Sky Worship Ritual and a “small” one. The former occurs during a year when there is no Dwarf Spirit Ceremony, and the latter occurs during a year when there is. The small worship is held at Pan Yi-Fu’s house at Dapin, Ponlai Village. The big one is held in Pan Chin-Wan’s house at Ponlai village. The Dwarf Spirit Ceremony (pas-daai) is held on a full moon day after the harvest around the 15th day of the 10th lunar month. It was actually held annually before the period of Japanese Rule, after which it has been held every two years for a small ritual and every ten years for a big one. It is coordinated by the Chu family. Other surname groups provide shoulder flags and “buttock bells,” and assist with various menial tasks to prepare for the ritual. In the Saisyiat religion, each clan has an individual sect, which serves various religious functions for the society. The Pan family is responsible for the worship of the Female Deity Koko Waan, who is in charge of managing sunshine, rain, wind and epidemic disease. The Sha and Shie families serve Vaki Solo, who has the power to send sunshine when continuous rain and clouds are harming people. 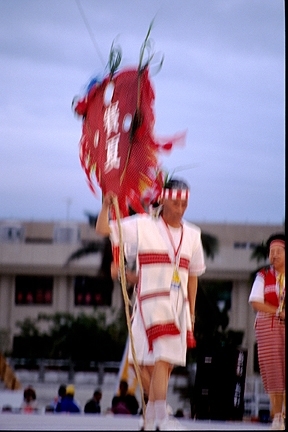 The Wind Pressing-Down Ritual is conducted by the Fong family, who serve Vaki Voon, who commands winds and storms; the Tsaou (Dou) serve the god of War, Vaki Dinado, and the god of Water, Vaki gadete; the Choung serve the Thunder Couple Vaki Biwa and Koko Biwa. There is no consensus on the hierarchical order among various deities, but each clan always puts emphasis on the deities that it serves, in order to strengthen the importance of surnames in forming groups. The Saisiyat were given Chinese surnames by Emperor Dao-Kuwan of the Qing Dynasty at 1826, and they also began dressing in the Han Chinese style, speaking Chinese, cultivating land and paying taxes to earn the name “Nan-Chuan Hua-Fan” (The barbarians of Nan-Chuan who submit their authority to the Emperor). That set them apart from the neighboring “ShangFan” (those not enculturated by Han Chinese), who were not under the Emperor’s authority. Whether they are an independent ethnic group or belong to the Daokas has been debated by scholars for several hundred years. The Saisiyat do not have a clear foundation to consider themselves an independent ethnic group, nor do scholars have clear evidence for classifying them as such. 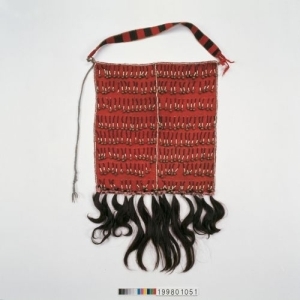 However, it is certain that their interactions with other ethnic groups, such as the Atayal and the Hakka, have affected them, leading them to form an awareness of themselves as a group. In addition, they emphasize the Sky Worship Ritual and the Dwarf Spirit Ceremony to distinguish themselves from the Han Chinese and the Atayal, forming a clear and exclusive boundary that defines them as the Saisiyat group, and that is becoming ever more distinct.